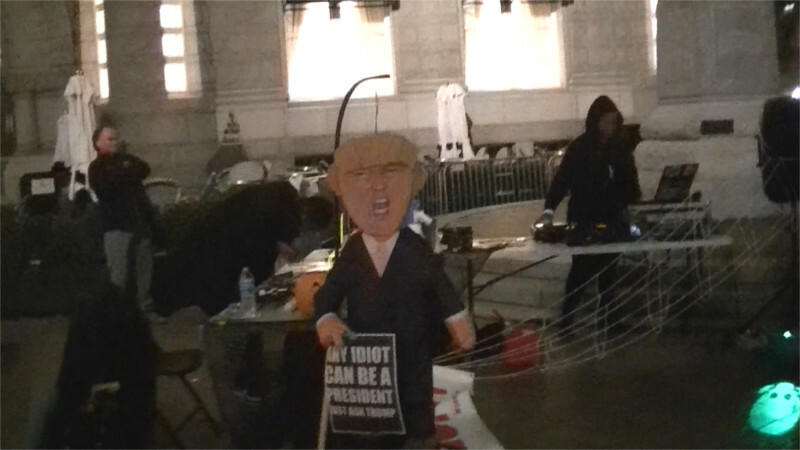 On the 30th of October, a pre-Halloween dance party at Trump Hotel featured a balloon banner lift for hurricane relief-and a genuine, made in Mexico Trump pinyata. On the 28th of October, Climate First! showed up in front of the Wells Fargo branch near Howard University, which they reported is the last Wells Fargo branch in DC to be open on Saturdays. Activists were there to protest the bank's role in funding the proposed Keystone XL tar sands pipeline, which TransCanada will announce in December whether they still plan to go forward with or not. The Shortwave Report 10/27/17 Listen Globally! Read more about The Shortwave Report 10/27/17 Listen Globally! 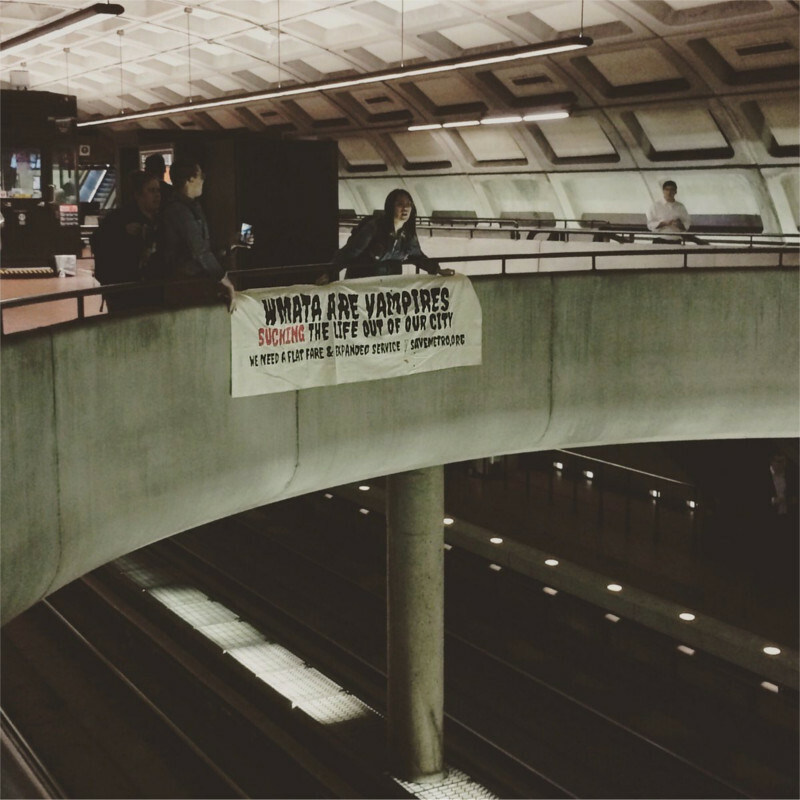 Banner drop calls WMATA bosses "vampires"
On the morning of the 25th of October, a banner drop at the Dupont Circle Metro station denounced the fare-hiking, service-cutting, cop-loving managers of WMATA as "vampires sucking the life out of our city." Read more about Banner drop calls WMATA bosses "vampires"
On October 24, the 30th running of the annual pre-Halloween High Heel Race took over 17th st. Several participants lampooned Donald Trump, two of them about the paper towels he tossed in Puerto Rico as though a roll of paper towels could wipe up Hurricane Maria's mess. We are so thrilled about his release. It is a day to celebrate, but we must be mindful, too, of the post-release challenges that await Dane, and offer our help, whenever, however, and wherever we can. 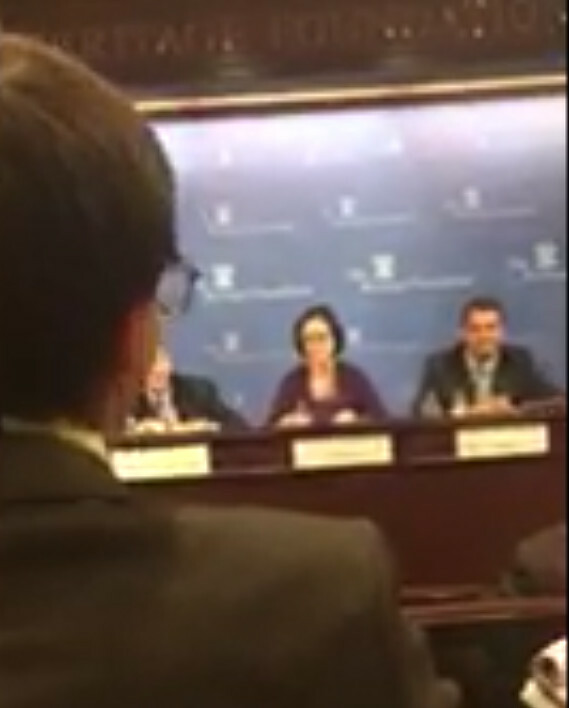 Rebuilding his life (under probation restrictions and release conditions) is no small thing. Folks who know Dane personally will realize how different the life he will be required to live over the next two years on probation will be from the life he envisioned for himself—in the short term, at least. 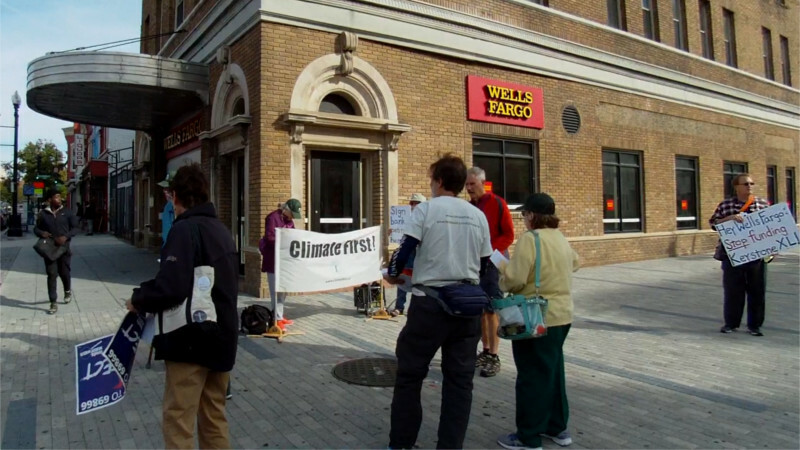 On the 23ed of October, DC reinvest protested at the Wilson Building, demanding that the city government remove all its accounts and business from Wells Fargo. 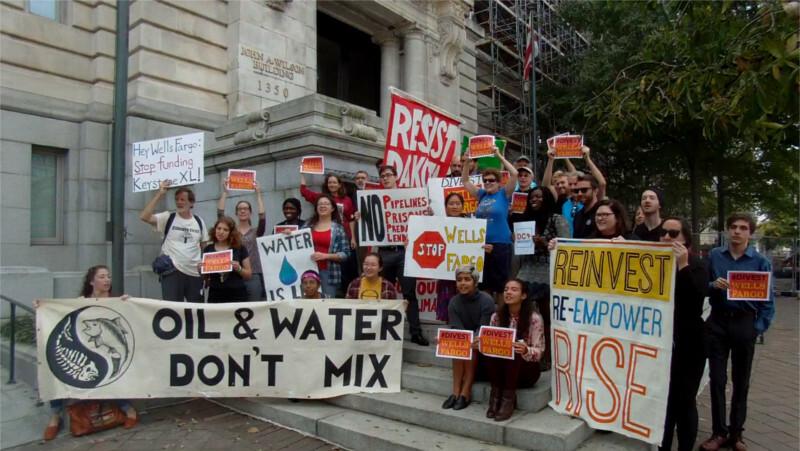 A resolution has been introduced in the council to divest, and activists are focussing pressure on councilmember Jack Evans to get it brought to a vote. Wells Fargo's failing community reinvestment score triggers an existing DC law forbidding the city's business relationship with this notorious and predatory bank. 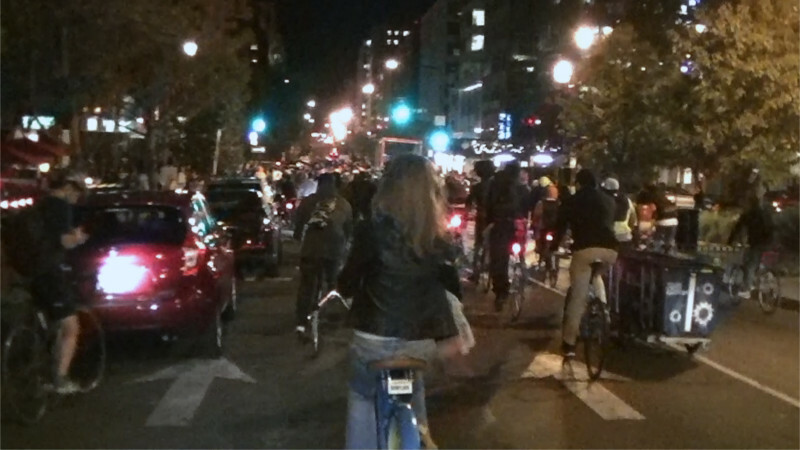 On the 18th of October, the monthly DC Bike Party took place a week later than normal and had a special pre-Halloween theme. This was the "Dark Alleys" ride, with some riders in costume and a lot of alley cut-throughs included on the route. Read more about The Shortwave Report 10/20/17 Listen Globally! 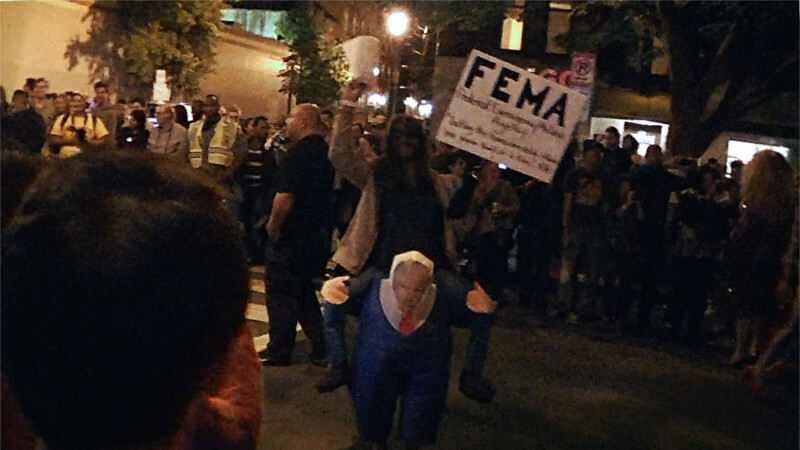 On the 18th of October, Puerto Ricans and supporters marched from the US Capitol to FEMA, demanding the Federal government provide aid for a community where power is still out, food and clean water are hard to get, and the impacts of Hurricane Maria are still largely unabated. One marcher from Silver Spring was quoted by the Washington Post as being especially incensed by Donald Trump's tossing of paper towels during his visit to the island, as though the ravages of the hurricane could be simply wiped up. On the 17th of October, a Federal court blocked Trump's third version of his Muslim Ban in response to a lawsuit by Hawaii. Trump being certain to appeal as before, mobilizing continues against the ban. 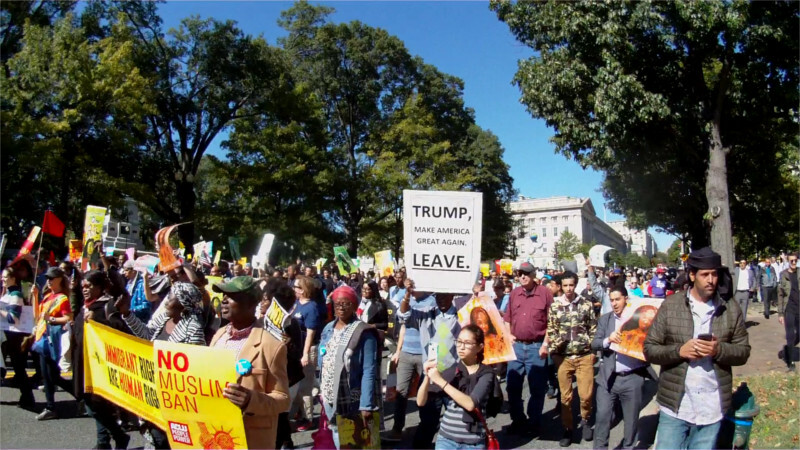 On Oct 18, the day it was supposed to go into effect, a large protest marched from the White House to Trump Hotel.